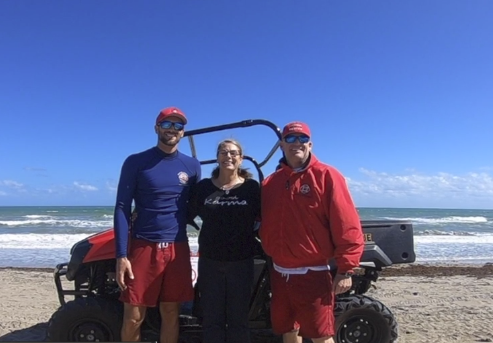 JENSEN BEACH, Fla. -- Along Jensen Beach Thursday, Martin County Ocean Rescue held a rescue demonstration. Ian Albertson and Ian Montgelas were two of the lifeguards. Among the crowd watching was Sgt. Teresa Dennis with the Port St. Lucie Police Department. But back in October of last year, it was a different story. That's when Teresa collapsed in the water at Jensen Beach and someone came to the rescue. “I can’t believe I’m standing here listening to this knowing what happened,” said Dennis. “They carried me out of the water, saw me face forward in the water unconscious. He summoned the lifeguards, and four of them came,” said Dennis. “It looked very serious,” said Montgelas. He and Ian were two of four lifeguards there that day. “We started resuscitative efforts,” said Montgelas. Teresa is alive and well and back being a first responder. “I'm just grateful that she is alive and well and back at work,” said Montgelas. This week both Ians, the first, first responder and two other lifeguards received awards for their heroics.